MONROE, Mich. -- Competing in a bass fishing tournament two years ago, Todd Steele cast his rod from his 21-foot motorboat - unaware that he was being poisoned. A thick, green scum coated western Lake Erie. And Steele, a semipro angler, was sickened by it. Driving home to Port Huron, Michigan, he felt lightheaded, nauseous. By the next morning he was too dizzy to stand, his overheated body covered with painful hives. Hospital tests blamed toxic algae, a rising threat to U.S. waters. "It attacked my immune system and shut down my body's ability to sweat," Steele said. "If I wasn't a healthy 51-year-old and had some type of medical condition, it could have killed me." He recovered, but Lake Erie hasn't. Nor have other waterways choked with algae that's sickening people, killing animals and hammering the economy. The scourge is escalating from occasional nuisance to severe, widespread hazard, overwhelming government efforts to curb a leading cause: fertilizer runoff from farms. Pungent, sometimes toxic blobs are fouling waterways from the Great Lakes to Chesapeake Bay, from the Snake River in Idaho to New York's Finger Lakes and reservoirs in California's Central Valley. Last year, Florida's governor declared a state of emergency and beaches were closed when algae blooms spread from Lake Okeechobee to nearby estuaries. More than 100 people fell ill after swimming in Utah's largest freshwater lake. Pets and livestock have died after drinking algae-laced water, including 32 cattle on an Oregon ranch in July. Oxygen-starved "dead zones" caused by algae decay have increased 30-fold since 1960, causing massive fish kills. This summer's zone in the Gulf of Mexico was the biggest on record. Tourism and recreation have suffered. An international water skiing festival in Milwaukee was canceled in August; scores of swimming areas were closed nationwide. Algae are essential to food chains, but these tiny plants and bacteria sometimes multiply out of control. Within the past decade, outbreaks have been reported in every state, a trend likely to accelerate as climate change boosts water temperatures. "It's a big, pervasive threat that we as a society are not doing nearly enough to solve," said Don Scavia, a University of Michigan environmental scientist. "If we increase the amount of toxic algae in our drinking water supply, it's going to put people's health at risk. Even if it's not toxic, people don't want to go near it. They don't want to fish in it or swim in it. That means loss of jobs and tax revenue." Many monster blooms are triggered by an overload of agricultural fertilizers in warm, calm waters, scientists say. Chemicals and manure intended to nourish crops are washing into lakes, streams and oceans, providing an endless buffet for algae. - Levels of algae-feeding nutrients such as nitrogen and phosphorus are climbing in many lakes and streams. - A small minority of farms participate in federal programs that promote practices to reduce fertilizer runoff. When more farmers want to sign up, there often isn't enough money. - Despite years of research and testing, it's debatable how well these measures work. The AP's findings underscore what many experts consider a fatal flaw in government policy: Instead of ordering agriculture to stem the flood of nutrients, regulators seek voluntary cooperation, an approach not afforded other big polluters. Farmers are asked to take steps such as planting "cover crops" to reduce off-season erosion, or installing more efficient irrigation systems — often with taxpayers helping foot the bill. The U.S. Natural Resources Conservation Service, part of the Department of Agriculture, says it has spent more than $29 billion on voluntary, incentive-based programs since 2009 to make some 500,000 operations more environmentally friendly. Jimmy Bramblett, deputy chief for programs, told AP the efforts had produced "tremendous" results but acknowledged only about 6 percent of the nation's roughly 2 million farms are enrolled at any time. In response to a Freedom of Information Act request, the agency provided data about its biggest spending initiative, the Environmental Quality Incentives Program (EQIP), which contracts with farmers to use pollution-prevention measures and pays up to 75 percent of their costs. An AP analysis shows the agency paid out more than $1.8 billion between 2009 and 2016 to share costs for 45 practices designed to cut nutrient and sediment runoff or otherwise improve water quality. A total of $2.5 billion was pledged during the period. Of that, $51 million was targeted for Indiana, Michigan and Ohio farmers in the watershed flowing into western Lake Erie, where fisherman Steele was sickened. Yet some of the lake's biggest algae blooms showed up during those seven years. The largest on record appeared in 2015, blanketing 300 square miles — the size of New York City. The previous year, an algae toxin described in military texts as being as lethal as a biological weapon forced a two-day tap water shutdown for more than 400,000 customers in Toledo. This summer, another bloom oozed across part of the lake and up a primary tributary, the Maumee River, to the city's downtown for the first time in memory. 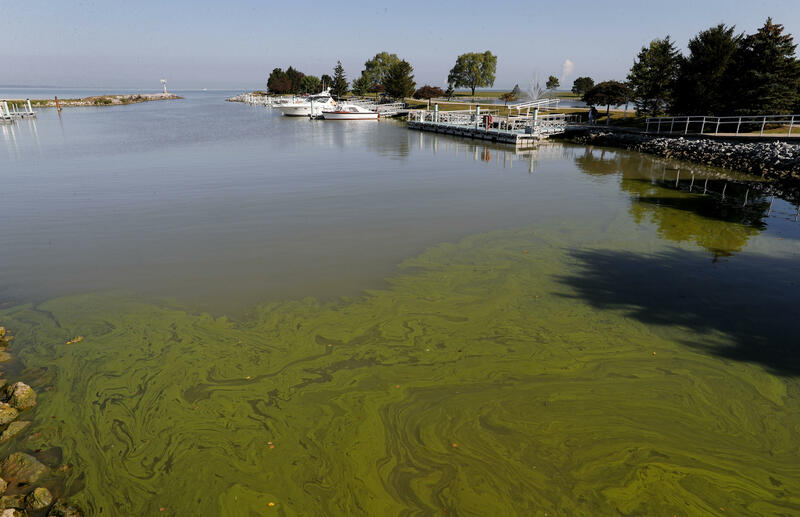 The type of phosphorus fueling the algae outbreak has doubled in western Lake Erie tributaries since EQIP started in the mid-1990s, according to research scientist Laura Johnson of Ohio's Heidelberg University. Scientists estimate about 85 percent of the Maumee's phosphorus comes from croplands and livestock operations. NRCS reports, meanwhile, claim that conservation measures have prevented huge volumes of nutrient and sediment losses from farm fields. Although the federal government and most states refuse to make such anti-pollution methods mandatory, many experts say limiting runoff is the only way to rein in rampaging algae. A U.S.-Canadian panel seeking a 40 percent cut in Lake Erie phosphorus runoff wants to make controlling nutrients a condition for receiving federally subsidized crop insurance. "We've had decades of approaching this issue largely through a voluntary framework," said Jon Devine, senior attorney for the Natural Resources Defense Council. "Clearly the existing system isn't working." Farmers, though, say they can accomplish more by experimenting and learning from each other than following government dictates. "There's enough rules already," said John Weiser, a third-generation dairyman with 5,000 cows in Brown County, Wisconsin, where nutrient overload causes algae and dead zones in Lake Michigan's Green Bay. "Farmers are stewards of the land. We want to fix the problem as much as anybody else does." The Environmental Protection Agency says indirect runoff from agriculture and other sources, such as urban lawns, is now the biggest source of U.S. water pollution. But a loophole in the Clean Water Act of 1972 prevents the government from regulating runoff as it does pollution from sewage plants and factories that release waste directly into waterways. They are required to get permits requiring treatment and limiting discharges, and violators can be fined or imprisoned. Those rules don't apply to farm fertilizers that wash into streams and lakes when it rains. Congress has shown no inclination to change that. Without economic consequences for allowing runoff, farmers have an incentive to use all the fertilizer needed to produce the highest yield, said Mark Clark, a University of Florida wetland ecologist. "There's nothing that says, 'For every excessive pound I put on, I'll have to pay a fee.' There's no stick." Some states have rules, including fertilizer application standards intended to minimize runoff. Minnesota requires 50-foot vegetation buffers around public waterways. Farmers in Maryland must keep livestock from defecating in streams that feed the Chesapeake Bay, where agriculture causes about half the nutrient pollution of the nation's biggest estuary. But states mostly avoid challenging the powerful agriculture industry. Wisconsin issues water quality permits for big livestock farms, where 2,500 cows can generate as much waste as a city of 400,000 residents. But its Department of Natural Resources was sued by a dairy group this summer after strengthening manure regulations. The state's former head of runoff management, Gordon Stevenson, is among those who doubt that the voluntary approach will be enough to make headway with the algae problem. "Those best-management practices are a far cry from the treatment that a pulp and paper mill or a foundry or a cannery or a sewage plant has to do before they let the wastewater go," he said. "It's like the Stone Age versus the Space Age." Do the anti-pollution measures subsidized by the government to the tune of billions of dollars actually work? Agriculture Department studies of selected watersheds, based largely on farmer surveys and computer models, credit them with dramatic cutbacks in runoff. One found nitrogen flows from croplands in the Mississippi River watershed to the Gulf of Mexico would be 28 percent higher without those steps being taken. Critics contend such reports are based mostly on speculation, rather than on actually testing the water flowing off fields. Although there is not a nationwide evaluation, Bramblett said "edge of field" monitoring the government started funding in 2013 points to the success of the incentives program in certain regions. Federal audits and scientific reports raise other problems: Decisions about which farms get funding are based too little on what's best for the environment; there aren't enough inspections to ensure the measures taken are done properly; farm privacy laws make it hard for regulators to verify results. It's widely agreed that such pollution controls can make at least some difference. But experts say lots more participation is needed. "The practices are completely overwhelmed," said Stephen Carpenter, a University of Wisconsin lake ecologist. "Relying on them to solve the nation's algae bloom problem is like using Band-Aids on hemorrhages." The AP found that the incentives program pledged $394 million between 2009 and 2016 for irrigation systems intended to reduce runoff — more than on any other water protection effort. In arid western Idaho, where phosphorus runoff is linked to algae blooms and fish kills in the lower Snake River, government funding is helping farmer Mike Goodson install equipment to convert to "drip irrigation" rather than flooding all of his 550 acres with water diverted from rivers and creeks. But only 795 water protection contracts were signed by Idaho farmers between 2014 and 2016, accounting for just over 1 percent of the roughly 11.7 million farmland acres statewide. Even if many farmers are preventing runoff without government subsidies, as Bramblett contends, the numbers suggest there's a long way to go. Goodson says forcing others to follow his example would backfire. "Farmers have a bad taste for regulatory agencies," he said, gazing across the flat, wind-swept landscape. "We pride ourselves on living off the land, and we try to preserve and conserve our resources." But allowing farmers to decide whether to participate can be costly to others. The city of Boise completed a $20 million project last year that will remove phosphorus flowing off irrigated farmland before it reaches the Snake River. Brent Peterson spends long days in a mud-spattered pickup truck, promoting runoff prevention in eastern Wisconsin's Lower Fox River watershed, where dairy cows excrete millions of gallons of manure daily — much of it sprayed onto cornfields as fertilizer. The river empties into algae-plagued Green Bay, which contains less than 2 percent of Lake Michigan's water but receives one-third of the entire lake's nutrient flow. Farmers in the watershed were pledged $10 million from 2009 to 2016 to help address the problem, the AP found. Peterson, employed by two counties with many hundreds of farms, has lined up six "demonstration farms" to use EQIP-funded runoff prevention, especially cover crops. "This is a big step for a lot of these guys," he said. "It's out of their comfort zone." And for all the money devoted to EQIP, only 23 percent of eligible applications for grants were funded in 2015, according to the National Sustainable Agriculture Coalition. Funding of the incentives program has risen from just over $1 billion in 2009 to $1.45 billion last year. The Trump administration's 2018 budget proposes a slight cut. "It sounds like a lot, but the amount of money we're spending is woefully inadequate," said Johnson of Heidelberg University. While there's no comprehensive tally of algae outbreaks, many experts agree they're "quickly becoming a global epidemic," said Anna Michalak, an ecologist at the Carnegie Institution for Science at Stanford University. A rising number of water bodies across the U.S. have excessive levels of nutrients and blue-green algae, according to a 2016 report by the Environmental Protection Agency and U.S. Geological Survey. The algae-generated toxin that sickened Steele in Lake Erie was found in one-third of the 1,161 lakes and reservoirs the agencies studied. California last year reported toxic blooms in more than 40 lakes and waterways, the most in state history. New York created a team of specialists to confront the mounting problem in the Finger Lakes, a tourist magnet cherished for sparkling waters amid lush hillsides dotted with vineyards. Two cities reported algae toxins in their drinking water in 2016, a first in New York. More than half the lakes were smeared with garish green blooms this summer. "The headlines were basically saying, 'Don't go into the water, don't touch the water,'" said Andy Zepp, executive director of the Finger Lakes Land Trust, who lives near Cayauga Lake in Ithaca. "I have an 11-year-old daughter, and I'm wondering, do I want to take her out on the lake?" The U.S. Centers for Disease Control and Prevention is developing a system for compiling data on algae-related illnesses. A 2009-10 study tallied at least 61 victims in three states, a total the authors acknowledged was likely understated. Anecdotal reports abound — a young boy hospitalized after swimming in a lake near Alexandria, Minnesota; a woman sickened while jet-skiing on Grand Lake St. Marys in western Ohio. Signs posted at boat launches in the Hells Canyon area along the Idaho-Oregon line are typical of those at many recreation areas nationwide: "DANGER: DO NOT GO IN OR NEAR WATER" if there's algae. In Florida, artesian springs beloved by underwater divers are tainted by algae that causes a skin rash called "swimmer's itch." Elsewhere, domestic and wild animals are dying after ingesting algae-tainted water. A year ago, shortly after a frolic in Idaho's Snake River, Briedi Gillespie's 11-year-old Chesapeake Bay retriever stopped breathing. Her respiratory muscles were paralyzed, her gums dark blue from lack of air. Gillespie, a professor of veterinary medicine, and her veterinarian husband performed mouth-to-nose resuscitation and chest massage while racing their beloved Rose to a clinic. They spent eight hours pumping oxygen into her lungs and steroids into her veins. She pulled through. The next day, Gillespie spotted Rose's paw prints in a purplish, slimy patch on the riverbank and took samples from nearby water. They were laced with algae toxins. "It was pretty horrendous," Gillespie said. "This is my baby girl. How thankful I am that we could recognize what was going on and had the facilities we did, or she'd be gone."